If you haven’t noticed, the creators movement is in full swing, with new developments from YouTube, Snapchat, Vessel, and more. With the proliferation of text and user preference toward visual and audio-based content, the highly connected user bases of the big social networks, and trust in peers vs. companies, I have no doubt as to why the creators movement is taking off. 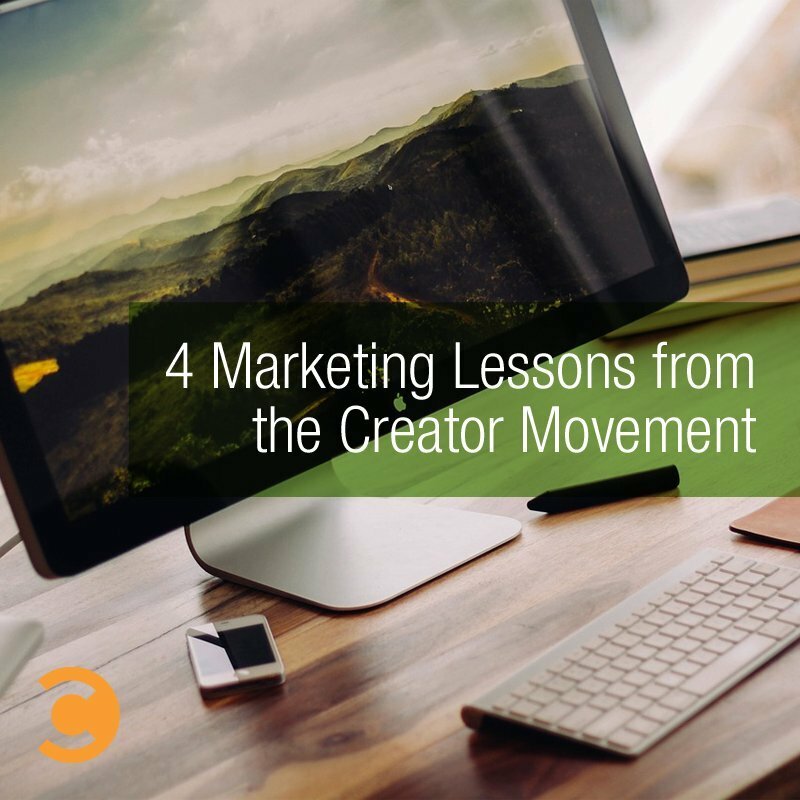 There are many lessons that marketers can learn about the new class of creators. We can certainly learn a lot about the type of content that is created, interacting with a community, and monetizing attention. For me, it ultimately comes down to these four principles: Authenticity, Earned Trust, Network Economics, and Community First. First off, have you ever seen a video by Charlie McDonnell? It is literally him and another guy sitting in a chair talking. I don’t know how much lower production you can get. His videos have received almost 5 million views since he started posting in 2011. The reason why his videos are so popular is two-fold: First, the items they discuss are entertaining. Second, because it isn’t over-produced, the user can relate more to Charlie. Key Takeaway: Don’t over-engineer something. Just get on camera, and make sure you bring your true personality to the table. People will trust you more when you don’t over-produce your content. So how do you go about building trust? It’s very simple. Drop value bombs. Value bombs can come in many forms, whether it’s knowledge or entertainment. The key is making the content so special that it literally feels like a bomb of value was dropped on you. I guarantee you that you’ve felt it before—especially on Convince & Convert. I was recently listening to the Social Media Marketing podcast with Mike Stelzner, and he was interviewing Mark Schaefer. Mark said something that stuck with me. He told a story about a woman who told him that sometimes she doesn’t read his blog posts but shares his content regardless. She trusts him to produce top quality content so much that she is proud to share his content regardless of whether she reads it or not. Key Takeaway: Do what you say you’re going to do, and don’t let the meat of the content suffer. Don’t let over-production trick you into assuming it’s quality content, either. In the early 2000s, forums picked up steam. Then along came LinkedIn, then Facebook, Twitter, and YouTube. Next, we saw mobile-first apps like Vine and Snapchat rise in popularity and valuations. What do all of these social networks amount to? They equal one giant, connected ecosystem of supply and demand for content. We’re now seeing companies like Nick Cicero’s Delmondo and Twitter’s Niche create platforms that connect brands and creators. Over time, we will start to see automation of pricing for creator content, based on supply and demand over the network. It’s the holy grail of business network economics. Smart marketers realize that it doesn’t make sense to create every single piece of content themselves. Those same smart marketers are splitting their content creation up into quarters. 25% of their content is produced by agencies, 25% by employees, 25% by customers, and 25% by influencers. Key Takeaway: Start looking to tap business networks to achieve economies of scale vs. going through the traditional content creation route. It will pay off in quality and cost. The very best creators wouldn’t be who they are without their community of advocates. Gary Vaynerchuk’s #AskGaryVee is based on his community asking questions and him answering. Remember Charlie McDonnell from above? Yep, he includes his community, too. Whenever you create content, make sure you highlight active members of your community. Think about how you feel when someone influential mentions you in a Tweet or YouTube video. You feel amazing, right? And guess what you’re more likely to do? Share the heck out of that Tweet or YouTube video! Key Takeaway: Your community is why your business exists. Don’t forget to include your community in content creation and promotion. If you lead your marketing programs with all of the above principles, you’ll be a-okay in this hyper-connected, mobile, creator-first world. Carry on, and don’t let the status quo stop you from being great. Nick Robinson is a Digital Marketing Manager at SAP. You can find him blogging at Marketing Curiosity. Nick is also co-host of two podcasts, Creators Class and This Week in B2B Digital Marketing. He has a strong background in web development, marketing, and entrepreneurship. His professional experience with the web dates back to 1997 when he coded his first Geocities website. When not burning the midnight oil, you can find him at the gym, traveling, and spending time with family and pets.